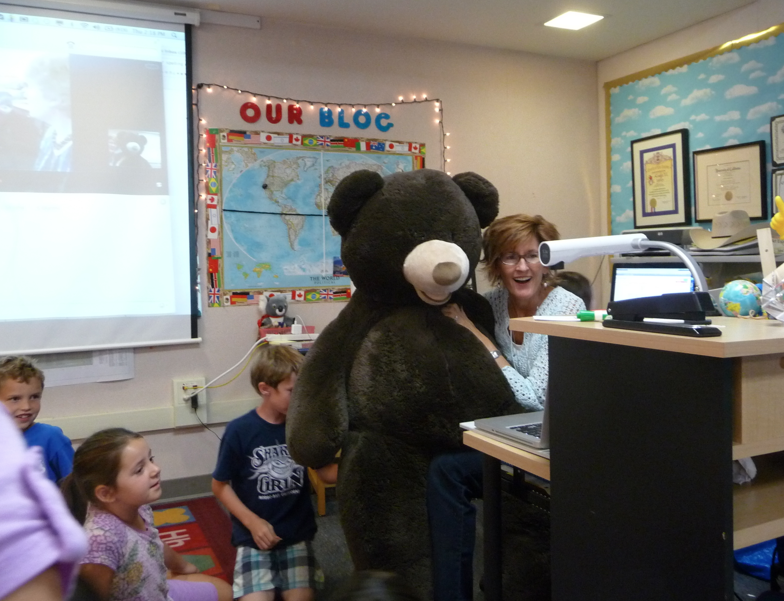 Mrs. Yollis' Classroom Blog: Skype: Rural New Zealand & Suburban California! 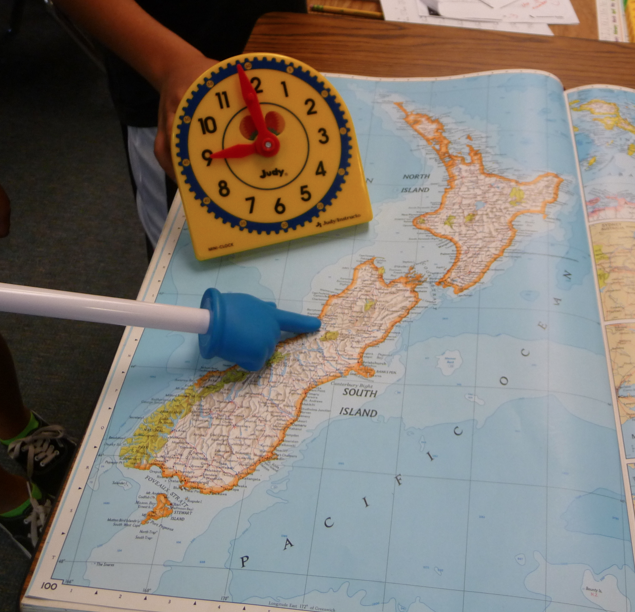 Mappers located New Zealand in our big, blue atlas! How could this be? The answer, time zones. Everyone was excited to meet the blogging buddies and each person had a job to do. 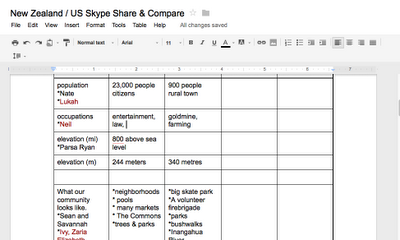 Here are some screenshots of the Google doc. Students filled in the information on the table! What do you notice about our two school? What do you notice about our two communities? Students shared all kinds of community information. 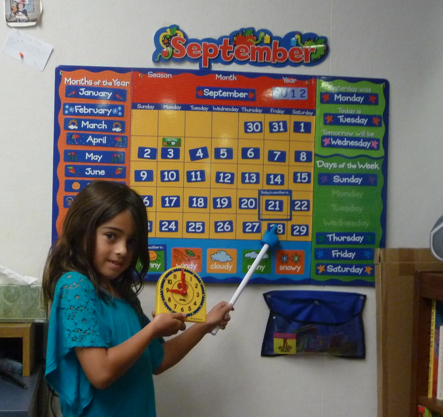 We used white boards to write the important words or numbers. We learned that we live in a suburb and our New Zealand friends live in a rural area. How many feet (or meters) are we above sea level? 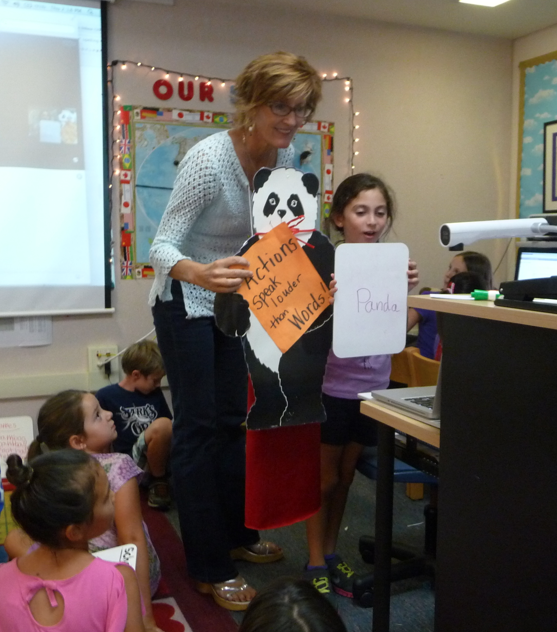 Everyone enjoyed meeting the class mascots, Panda and Beverly! Panda was ready with a useful message! Panda was still wearing his super hero cape! Beverly came out of her long hibernation and met the new blogging buddies. She was especially interested in a couch she saw in B4's classroom. Oh, Beverly! B4 has some fabulous mascots as well! We met the cheeky Quicksilver who is a bird. We wonder what kind of bird he is? Wise and kind Mr. Beesley. We think Panda and Mr. Beesley would be fast friends! Our timer said that the call started at 1:58 P.M. and ended at 2:26 P.M. Thank you to our class photographer for the wonderful photo documentation! 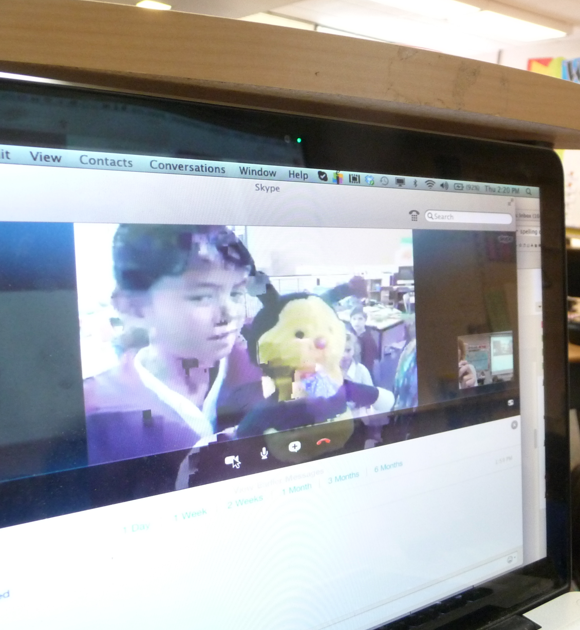 Have you ever Skyped with someone? Do you have any follow up questions for the New Zealanders or us? Thank you for skyping with us yesterday. It was wonderful to meet you and to learn a little more about your community and your school. 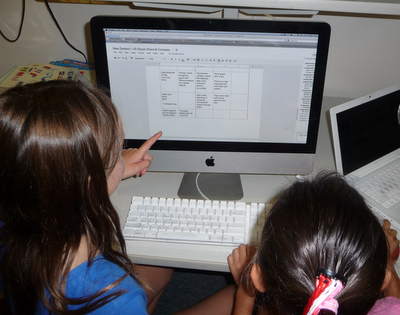 Using a Google doc was a new experience for us. We thought it was fun watching you fill in information while we were! It was interesting finding out that more B4 children seemed to walk, bike or ride a scooter to school. We think it is easy in our town because it is flat. Is it flat in your community? I loved skyping with you yesterday. It is not very flat here. For example, I live on a hill. I wish I could walk to school, but there is a busy street between our house and school. Also, it would probably take about 20 minutes to walk to school. When we go by car, it only takes 5 minutes. How long does it take most of you to walk to school? We are Zaria and Olivia. We liked skyping with you. Zaria liked the bit when you told us about the information. I liked the bit when we showed the kite to you. Olivia made a dragon kite. I made a diamond kite. Have you ever made a kite? Yes, I have skyped with my grandparents in India and my Aunt in Seattle many times. I have a question for Mrs. Mcenzie and B4. What grade are you in? Are you in a split class like us? 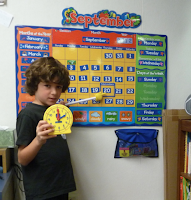 Our class is a year 2 and we are 7 and 6. Last term we had year 2/3, but the Year 3s moved into another classroom because we got some more Year 2s. We live in a rural town. Have you been to a rural town? I have been to a rural town before in India. When I went to India I think I was 4 or 5 years old. My parents and I went there to visit my family. What do you do to keep busy in your rural town? Wow! I loved reading all about the Skype session you had! What a great way to learn about other cultures and communities around the world! I found it particularly interesting to see the share and compare charts. I bet there are all kinds of things you can share and compare with each other. I would be curious if the New Zealand kids like the same foods American kids like...pizza? hamburger? chicken nuggets? Mallory said the New Zealand kids were giggling because they thought Mrs. Yollis' kids had a funny accent. Very cute! Can't wait to hear about the next Skype session. How often will you talk to each other? Will you be Skyping with another country next time? Thank you for a fabulous 2-point comment! 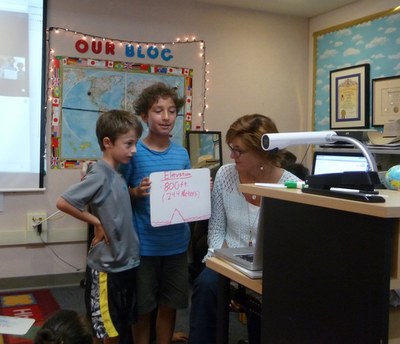 We evaluate the comments that come in from the class and you had many good things going for your comment. First, you had a wonderful greeting. Second, you wrote many thoughtful paragraphs. Third, you used high level words like: particularly, interesting, curious, and session. Finally, you proofread very well! You asked if we will be Skyping with anyone soon. 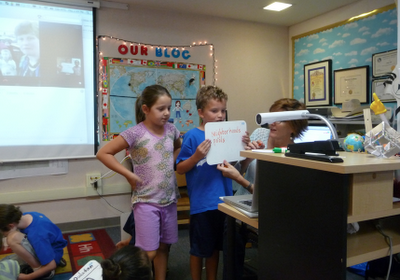 Yes, we will be Skyping with a class this Friday. All I am going to say is that it is a school on the east coast of the United States. Mallory said you are a teacher. How many students do you have in your class? 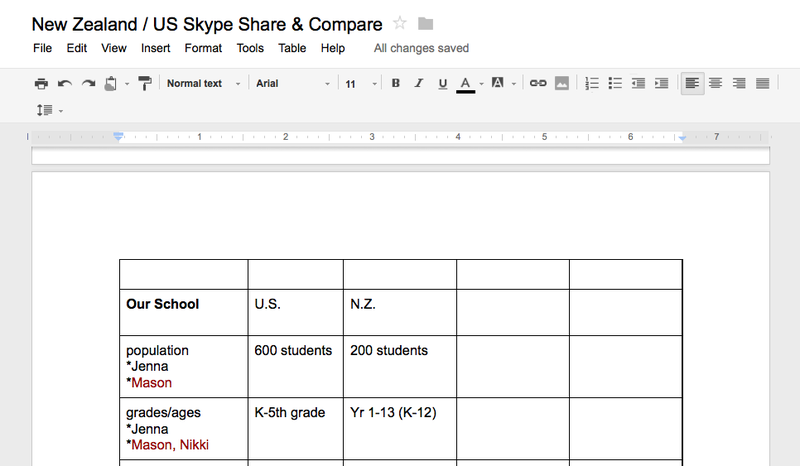 Have you ever Skyped with your class? Do you have a class mascot? How many years have you been teaching? Do you have any friends in foreign countries? Yes, I have skyped once before with my friend while she was on a trip. I noticed that B4 has less students in their school but more grades and our school has more children but less grades. I have one question for B4: what grade are you? What an amazing experience this must have been. 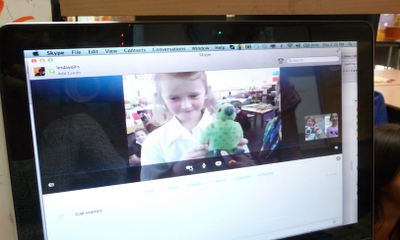 Skyping is a great way of sharing an experience. I have been in Reefton a couple times over the years. Travelling from Christchurch on the east coast to Greymouth on the west coast of New Zealand’s South Island, you have two major routes. One takes you through Arhur's Pass. The other takes you via Hamner Springs to Reefton. I have enjoyed both routes. Imagine, I have a group of 12 parents and children from my school. I'm their tour guide and bus driver and tell them one morning to dress warm but wear their swimming costumes. Looking outside our cabin, they see frost covered grass on a cold morning. They think I must be crazy but I ask them to trust me. We head north from Christchurch for some distance, passing the turn off for the Arthur’s Pass route and finally turn west. Flatter rural land starts to give way to hills and trees. We take a turn off the main road and head to Hamner Springs. Arriving, the group discovers why I asked them to wear swimmers. Hamner Springs has a collection of thermal pools heated by underground hot rock. Despite the cold air, they can choose from warm up to hot pools. Leaving Hamner Springs, we return to the main highway and again head west. We are climbing higher and find a place to stop because snow has started lightly falling. Swimming and playing in snow in the one day is an experience. Continuing our journey through beautiful gorges and mountains, we break out and start heading down from the mountains. We come to a beautiful town. We have arrived at Reefton. From there we can head north or south. After a short stop in town, we head south to Greymouth on the coast. 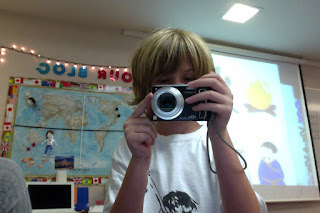 This is one of my memories of travelling to Reefton well before we had blogging and when the only computer in my school able to use the internet was my computer if I moved it to an office or ran a phone line to a modem. The year was 1985. 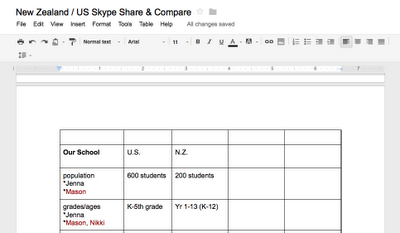 I was amazed with your post about Skyping with New Zealand! The part I liked the most was how both classes were adding to the Google document at the same time! I think being about to learn about each other in real time is one of the best aspects of using technology in the classroom. What was the most interesting or unusual fact you learned about New Zealand? My name is Collin from Mrs. Yollis' class. I had a great time skyping with you. I love your class mascots and how you weaved a kite! But I was confused when I heard that your school has ages 5 to 16 and only 200 people. About how many in each class? Are you in a split class like us? How long did it take to weave your awesome kite? About how big is your school? My name is Mason and Nathan and Aleigha. We really liked skyping with you. Nathan's favourite bit was when we held the kite up. Aleigha’s favourite bit was when the people held up the kite too. and Mason’s best bit was when the people held up the kite as well. We made it out of flax, bamboo and paua shells. We shared it at assembly. Mason and Nathan and Aleigha. 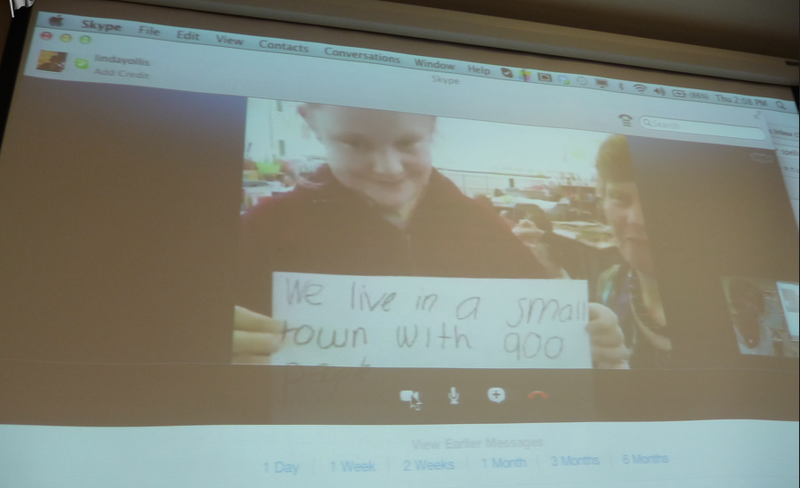 I had a lot of fun skyping with the class from New Zealand. I had the most fun seeing Chloe present Beverly. I have the same bear at home, only with a different name. My bear doesn't have a name. Where did you get your bear? I got my bear at Costco. My name is Jim and I am Collin's grandfather. His mother is my daughter. I really enjoyed reading about your skype session with the school children in New Zealand. One reason for this is because New Zealand has always fascinated me and is the ONE place I have promised myself I would visit in the next few years. Perhaps Collin and his sister could visit New Zealand with my wife and me. The only time I have skyped was at Collin's house when his father was skyping with other family members who live in northern California. It was lots of fun because we were able to see the newest addition to the family, Collin's cousin Alba. I would love to learn how to skype so I could skype with Collin and his family. I think it would be a great idea for Collin to teach me! 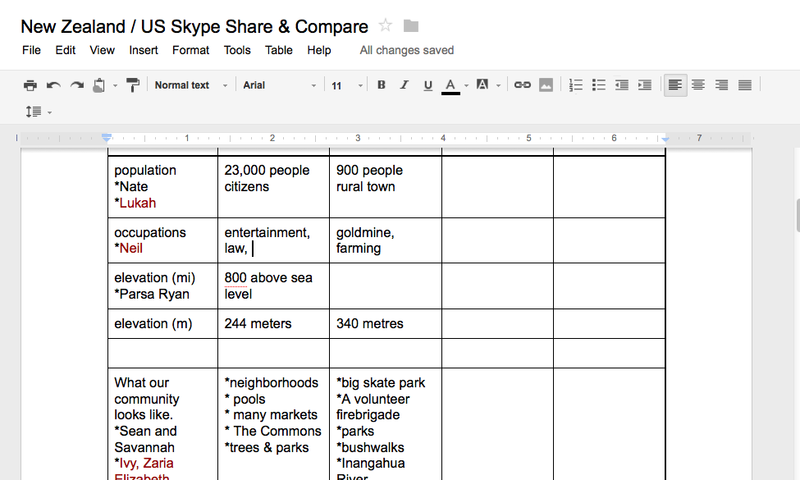 I think your skype session was a great way to learn about (and experience firsthand) the differences in time zones. To think that you were in school on a Thursday and chatting with other students who were in school on a Friday is kind of mind boggling to me! I must admit that I wish I had had this kind of lesson when I was a kid. Did this experience help you understand time zones? It was also a way to be exposed to people from a different country. Did you see or hear about things that we have in common? Did you like learning about the interesting differences? I can see that this school year is going to be a good one for all of you. I am going to continue reading your blog so I can keep up with all you are doing in class.